Does Higher SPF Sunblock Actually Make a Difference? What does SPF in sunblock stand for? I want to start by clarifying what exactly SPF stands for and what those words actually mean for you. SPF stands for Sun Protection Factor, and it represents the ratio of ultraviolet radiation (UVR) dose that causes the first noticeable redness on sunblock-protected skin versus the dose of UVR that causes the first noticeable redness on unprotected skin. In plain words, someone wearing SPF 30 would need to be exposed to 30 times more UVR before their skin turned red than someone (with the same skin type) that’s not wearing SPF 30. Does a higher SPF Sunblock really matter? For some reason, a rumor has been spreading that higher SPF sunblocks past 30 or 50 do not make a difference. This rumor is FALSE. To understand why, look at this way: SPF 15 allows 6.7% of damage-causing rays to hit the skin, while SPF 30 allows only 3.3%. So technically, just from going from SPF 15 to 30, you cut down the amount of radiation aging your skin and causing skin cancer in half. Now if you decide to surpass the SPF 30 and go straight to 60, you have again doubled your protection. Although this may be accurate, the SPF can only go so high without making sunscreen toxic and impractical. The best way to achieve higher SPF (think 150 – 250 levels) is to cover the skin with fabric. In other words: Wear hats, rash guards, long-sleeved fishing shirts, long pants, etc. in addition to wearing sunscreen on non-covered areas. 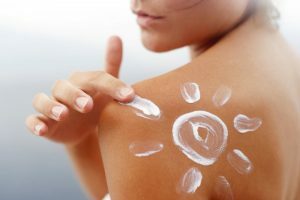 You may be asking yourself where the rumor came from that higher SPF “doesn’t matter.” The interesting thing about human behavior is that we tend to get a little overconfident when we feel so safe. Multiple studies have shown that the higher the SPF, the less sunblock people tend to apply. So it’s not that it isn’t effective, people just don’t use enough, or they think that because they’re using such a high SPF, they can stay out in the sun all day long without reapplying. To remedy this situation, it is recommended to apply sunscreen twice before actually going out into the cancerous UVRs. That way, you make sure you get a layer that’s thick enough, and you end up covering some body areas missed the first time around. Bottom line: Wear the higher SPFs if you have them! And sun responsibly!